Citation Information: J Clin Invest. 2016;126(8):3145-3157. https://doi.org/10.1172/JCI87033. 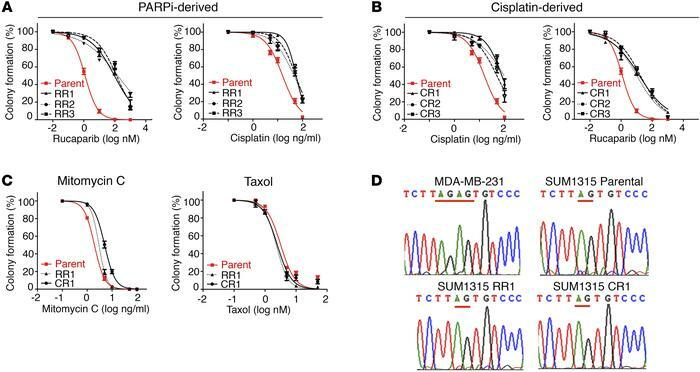 SUM1315MO2 PARPi- and cisplatin-resistant cells do not harbor reversion mutations. (A) SUM1315MO2 parental cells and RR1–3 cells were measured for primary resistance to rucaparib and cross-resistance to cisplatin. (B) SUM1315MO2 parental cells and CR1–3 cells were measured for primary resistance to cisplatin and cross-resistance to rucaparib. (C) SUM1315MO2 parental cells and RR1 and CR1 cells were assessed for mitomycin C and taxol sensitivity. Colony formation assays were employed throughout and three independent experiments were performed. (D) BRCA1 introns and exons from parental cells and resistant clones were subjected to Sanger sequencing; representative BRCA1 electropherograms are shown for parental cells and 6 resistant clones that were sequenced.